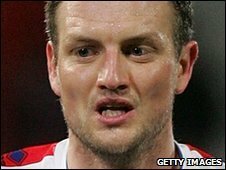 QPR have signed defender Clint Hill following the expiration of his contract with Crystal Palace. The Liverpool-born 31-year-old has signed a two-year contract at Loftus Road and teams up again with his former boss at Selhurst Park, Neil Warnock. "Neil played a massive role in my decision to move to QPR - he's such an infectious character," Hill told the club website. "He was probably the only manager who could tempt me to stay in the south." He added: "I'm expecting big things next season. The top six has to be the aim. I'm confident we'll be there or thereabouts. "I think it's about time the club pushed on - a club like QPR should be aiming for the Premier League. "There's a first-class set-up here in terms of the infrastructure and it's up to the players to push on to the next level now."